Today’s book review is for Defy, by Sara B. Larson, published by Scholastic. It is scheduled to be released January 7, 2014. I received an electronic copy of this book from the publisher, through NetGalley, in exchange for an honest review. 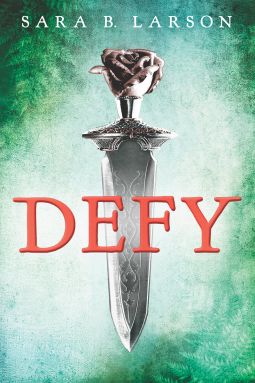 Defy is a thrilling YA fantasy debut from Sara B. Larson. It follows young fighter Alexa Hollen, who must disguise herself as a boy, Alex, when raiders come to her village and kill her parents. Alex and her twin brother, Marcel, work their way into the palace guard for Prince Damian of Antion. It’s not easy hiding her true identity, but she’s doing pretty good. That is, until a powerful sorcerer breaks into the palace and turns things upside down. Alex, her fellow guard Rylan, and Prince Damian are abducted and transported to a neighboring enemy kingdom. 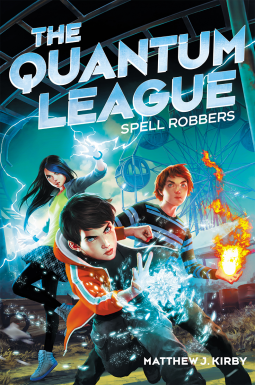 Amidst all of this, Alex’s true identity is found out–and she finds herself faced with Ryland and Damian both vying for her affections. 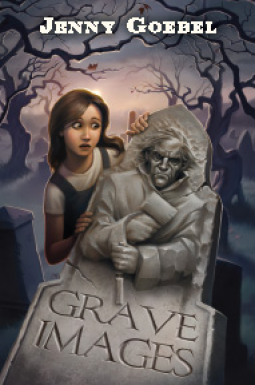 Soon she discovers that she’s not the only one harboring dangerous secrets, and not everything is as it seems in the kingdoms. Will she have the strength to sort out her feelings and save the kingdom before it’s too late? Only time will tell. I’ve long loved stories of women who feel compelled to live the lives of men. Part of it is because the women are able to demonstrate that, despite social opinion to the contrary, women are every bit as capable as men. Another part is the tension that it creates. As the audience is in on the secret, we can see the dangers threatening to expose our protagonist lurking around every corner. Moreover, we can laugh at the awkward moments and mis-communication that occur as the true identity struggles to assert itself once more (sometimes subconsciously) despite all the risks. Larson was able to deliver all of these things in her story. It was a real treat to see a female protagonist who was so strong, courageous and quick-witted, but also vulnerable and plagued with uncertainty. Although the character development was strong, what I really enjoyed were the interpersonal dynamics between the characters. There was complexity there. Loyalty to a fellow guardsmen can overcome personal competition. Enemies can become allies, but maybe not friends. Love, no matter how strong, doesn’t have to be acted upon. It was refreshing to see so much nuance and ambiguity in the relationships between characters. People are complex. It felt true to life. I also loved that even though the love triangle is a major storyline in the novel, there is still a lot of action. 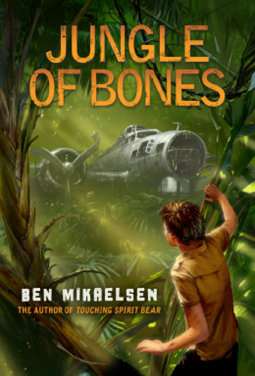 There are thrilling battles, ingenious escapes, and troubling treks through the jungle. For readers who don’t feel invested in the romance element, the political plot is equally engaging–and even more complex. The world that Larson has created is fascinating, broad and deep. Once I started reading this book, I couldn’t put it down. I stayed up into the wee hours of the night because I jut had to know what was going to happen. My biggest disappointment is that now I’m going to have to wait for a sequel. For that reason, I’m giving it 5 out of 5 stars. If you’re looking for a gripping fantasy with a side of love triangle, you should definitely consider picking up this book. It won’t disappoint.